What’s it like to be part of a bustling nutrition practice, while also writing for and coordinating a prolific blog? We’ll find out in today’s interview with Alex Raymond of Rebecca Bitzer & Associates and Empowered Eating, a separate blog designed to specifically support those who are recovering from an eating disorder. In her role as editor and blog coordinator, Alex and her intern Caroline work together to make sure a new post goes up on both sites at least once a week. On top of that, they schedule social media posts for each article to make sure it’s getting the widest reach possible (Meet Edgar saves them tons of time, she says). They also like to go back and re-post some of their more popular articles and seasonal blog posts. 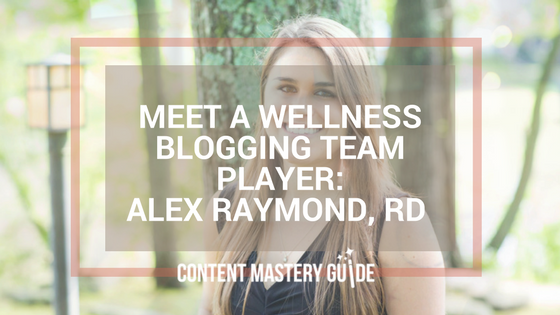 Alex says their weekly blogging schedule hasn’t been that difficult to keep up, since health, wellness, and nutrition are such hot topics these days. She finds inspiration from articles posted on social media, news outlets, or even movies and TV shows. She’s most inspired, she says, by the questions her clients ask or common themes she’s noticed in their sessions. “These days, having a disordered relationship with food is quite common. People are always trying to find quick nutrition fixes or some perfect diet. And many times these quick fixes don’t work and a ‘perfect diet’ doesn’t exist. To keep their content fresh and their readers engaged, Alex recently started a series of brief videos called “Mindful Minutes,” such as the one below about orthorexia. Specifically for the Empowered Eating blog, these videos cover topics like body image, mindful eating, and self-care. The goal is to supplement, not replace, the blog posts. As she goes back and edits posts – hers and others – she finds herself making executive decisions to cut down on sentence length, while still trying to preserve the original message of the content. All of this takes time, so I asked how she fits it all in. She says it’s not always easy to balance blogging, editing and seeing clients, so she tries to schedule time to work on blogging. If she finds herself with both inspiration and a little extra time (say, on a flight), she might sit down for 45 minutes straight and finish an entire post. Then she’ll send it to Caroline for publishing, but depending what’s already in the queue it may not go up for another few weeks. Typically, she can finish two or three posts in a few days, but other times she only gets to blog once a week and it can take two weeks to finish something. On average she spends about 60-90 minutes per post, depending on whether she also records a video. And we all need our blogging friends! I’m glad to have made some new friends in Rebecca and Alex, so I could bring you these insights into what goes on behind the scenes of a productive wellness blog. P.S. Does your clinic have a blog you could be writing for? Don’t miss the opportunity to share your ideas, spotlight your expertise, and attract new clients! Here are some of my tips for being part of a blogging team.